Why does the cold virus like me so much? I swear, it feels like I've been sick half this year. Atleast this time it was only 1 day of yuckies and we'll have to see how long it lingers. I've been trying to decide on a project for my nephews Christening (next summer). There are two of them, so I'm trying to plan ahead. 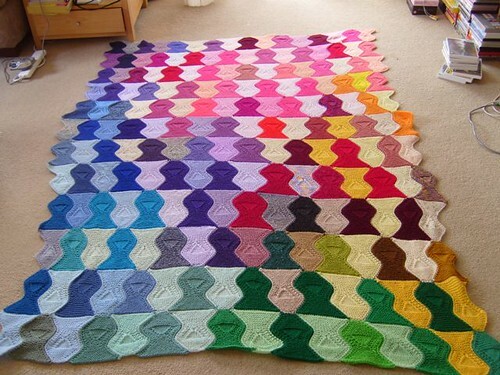 I've loved the knitted tesselating fish blanket pattern forever but wince at the thought of knitting two blankets! To my lucky (and very ecstatic) surprise, I found a crochet version on Ravelry! YEAH! Here's the Ravelry link, and the blog link for Eboni's fantastic pattern. I think it meshes well with the whole Christian theme, (Ichthys). So, here's the beginnings of my blanket. I'm soooo excited about this pattern. It's so fun and easy to do. Plus, you don't get bored because you're always looking forward to seeing what the next little fishie looks like next to his friends. Bro: "do you know how much i love you <3? Me: "yes, what do you want?" Bro: "you know me so well. a brown beanie." Me: "i'll see what i can do :P"
Bro: "you're the bestest sissy ever." Have I mentioned that he's spoiled? I love that HB fabric! I cant wait to see your bag completed! That fish blanket is hysterical! For your colds, I'm sure you already know to wash your hands frequently. You might try a saline solution like "Ayr" or a neti pot. (Frankly, I like Ayr's squeeze bottle better; the neti pot looks awkward). Basically, it's just saltwater you pump up your nose that flushes out pollution, pollen, germs, etc. Unlike nose spray, it is not addictive. Speaking of germs--when you are cleaning, don't forget doorknobs and the handles on the fridge! And have you changed out your toothbrush recently? I hope these little tips help you so that you are healthy enough through the fall and winter to keep on with all your cool projects. jeff was looking over my shoulder as i read your blog and was very impressed with the blanket, as was i. i feel i'm coming down with an illness as well. i'm attempting to fight it however i can. it will be cleared up for our date to india on friday. see you soon! I am always excited to see the things you make. You are so talented!! Great job. I love the fabric you picked. Waiting to see the finished project! I found you through your mom's blog. Cute fish, beautiful work. I teach a girls crochet group at church. We are called Servants Unseen and make scarves etc. for winter for the elder and widowed and also little somethings, like pot holders, for showers and for Missionaries. Do you have any cute and VERY easy patterns you could share. We especially need a super easy baby bootie pattern. How cute that blanket is! And I love the lining fabric you picked out for your bag! How funny that your brother calls you Sissy. My son has been calling my daughter Sissy since he first learned how to talk. hola estube cotilleando tu blog y q maravilla felicidades.